Updated February, 2015. New, bigger, better images and text. 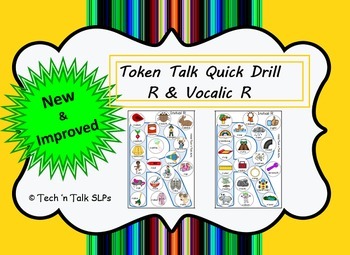 Token Talk Quick Drill for R from Tech 'n Talk SLPs is designed for use by Speech Therapists addressing correct articulation of the R and vowel controlled R sound variations. The product is also great for parents that are looking for a quick, fun way to practice speech sounds at home with their child. 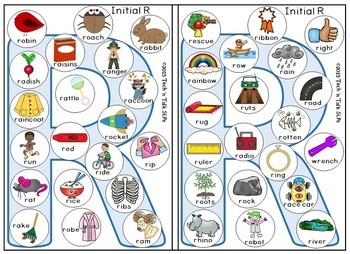 The product includes 7 token boards for practicing the R and vowel controlled R sounds. The token boards are perfect for use with penny sized tokens. 1 board each for initial position R, medial position ER, final position ER, combo board for AIR and OR, and a combo board for AR, EAR, and IRE. 2 blank boards are included to use with your own R picture cards or word lists. 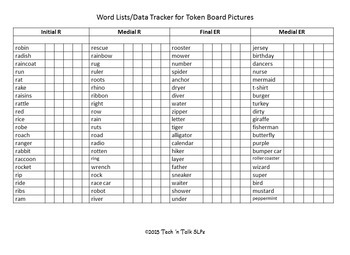 Also included are 2 pages that provide the target word list for each board along with spaces for data collection/charting of responses. This can very easily be used as a pre-test and post-test probe for progress monitoring.